SAN ANTONIO -- A defensive stand, words you probably wouldn't see when it comes to the Houston Rockets, clinched what coach Mike D'Antoni called "a signature win" on Wednesday night. Houston held on to defeat the San Antonio Spurs 101-99 and conclude a five-game, nine-day trip. "This is probably our best win," D'Antoni said. "Any time you beat a team like this on the road, it's a signature win. But we have a long way to go. Our fourth quarters are sometimes lacking and we have to get better." It's a game that will be remembered for the brilliance of James Harden, who recorded the first triple-double with 15 assists in franchise history. Harden finished with 24 points, 15 assists and 12 rebounds. A fourth-quarter turnover and a poor shot, however, kept the Spurs around. Harden's teammates bailed him out, with you guessed it, a defensive stand. "It's important for us and for our team, the only way we're going to get to where we want to go it's on the defensive end," he said. "The game wasn't pretty at all, defensively we got stops on a string and we get wins on the defensive end the wins are going to come." In the final minute, and his team ahead by two, Harden took a bad shot with Patty Mills on his hip with 45.7 seconds left. James Harden stayed sizzling hot as his first triple-double of the season helped the Rockets sink the Spurs. On the defensive end, Kawhi Leonard, who put on a quiet yet stunning performance with his 34 points, missed a leaner with Trevor Ariza sticking a hand in his face. The missed shot landed in Harden's hands and with another chance to seal it, he was called for a charge, banging into Mills with 5.8 seconds to play. Following two Spurs timeouts, the Rockets maintained their poise, and after Leonard missed on a drive, a fight for the ball near the glass ensued. LaMarcus Aldridge tried a tip-in and it bounced off the rim and Arzia grabbed the rebound at the buzzer. The Rockets bench erupted in excitement as if the Southwest Division title were clinched. Chest bumps, fist pumps and yelling came from the far end of the court as the Spurs walked off. The improvements on defense, tied with Harden's offensive presence, has this team believing in itself. "It was huge, it says a lot about how far we've come," Ryan Anderson said. "I think defensively we've been looking for a complete game and we've had a few minutes with stretches. You expect it with a San Antonio Spurs team, to go on runs. We had a few lapses, overall we had a good defensive game, almost 48 minutes. We answered their runs and did a great job of not letting the crowd get to us." Houston held the Spurs to only 19 fourth-quarter points, tying for the fewest points allowed in the final quarter this season. The Rockets' defense, which gave up only 39 second-half points, also tied for the fewest in a game this season. The Spurs shot 39.3 percent from the field as starter Pau Gasol was held to only two shots and Aldridge missed 10 of 15 attempts. Manu Ginobili made only 1 of 7 shots from the field off the bench. The Spurs didn't have Tony Parker, who will return this weekend from right knee soreness, and Danny Green made his debut after missing the first seven games because of a left quad strain. It's not really the Rockets' problem considering their goals of moving from the middle class in the West to the elite. When you have a player such as Harden who is exceptional at finding cutters to the basket and exhibits the physical gifts to split defenders on drives to the rim, you really don't worry about the offense. For Harden's efforts, it was his first triple-double of the season and 10th of his career. Houston is 9-1 in such games. "He's always been a great passer," Gregg Popovich said of Harden. "He has the ball in his hands a lot more as a point guard. He is one of the best players in the league. Very difficult to guard." As Harden continues this torrid stretch in November -- he has had five games with at least 15 assists -- the Rockets' defense is improving. Houston has endured some bad second halves. The Los Angeles Lakers on opening night closed the game with clutch buckets, and Cleveland at the start of this trip didn't miss a shot for the last seven minutes of the second half. However, we have seen the Rockets hold opponents to fewer than 40 points in the second half twice and fewer than 50 points five times. 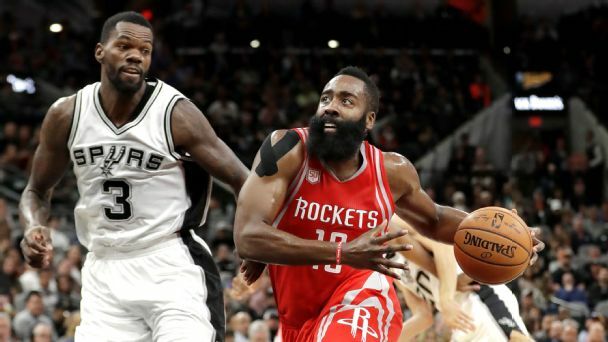 "To end a five-game road trip, we could have easily called it quits, against a really good team at home, we choose to fight," said Harden, who played a season-high 40 minutes. "In the fourth quarter they made a run, which we knew they were going to, we withstood it and got some stops and came away with the win."